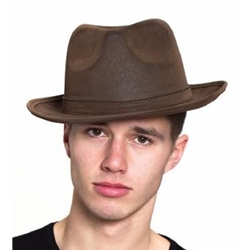 The Brown Gangster Hat is a one size fits most fedora. There is an elastic adjuster inside to help fit the hat to your needs. This hat is excellent to help portray a turn of the 20th century look. From Gangsters to bootleggers, from businessmen to musicians, this ubiquitous hat can serve as a crowning accessory for many different types of costumes.